From Content and interactivity to development itself! "... nearly nine in ten physicians believe that improved access to online medical information and resources has improved the quality of care at their own practice or organization." The difference between academic and professional learning for doctors. Health care professionals have more experience in selecting and processing digital information than the industry has experience in making it! Whereas information for healthcare professionals is basically about reliable and valid information, the format of it should be both appealing and interactively enough to gain and hold the interest of the professionals. 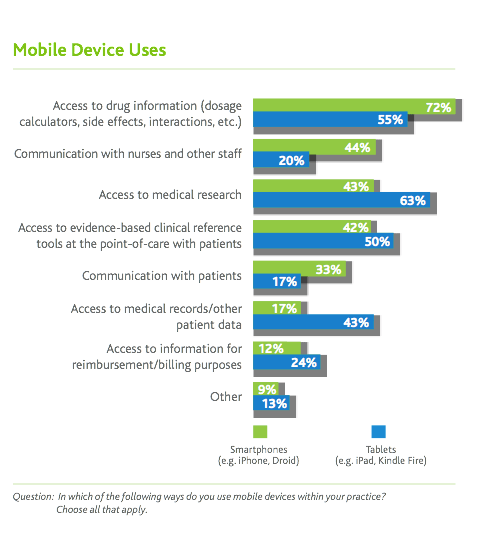 I came across several survey results regarding doctors’ use of mobile devices and about their routines in processing drug and medical information. It was also found that in the course of getting acquainted with the device, doctors seem to focus on different things! See the insightful pdf of the summary of the survey. In an earlier Kluwer health survey (2011, physicians see improvements..) it was found that nearly nine in ten physicians believe that improved access to online medical information and resources has improved the quality of care at their own practice or organization. A link is also given to use of smartphones by nurses, in this blog here. Indeed: “Pharma companies are far from realizing their App market potential,” is the conclusion of research done. See here. Seven in ten doctors even have a self-tracking patient, says Manhattan research, quoted here. See some other statistics on tele- and mhealth here. Health care is moving towards integrated care in eHealth: 76% of Patients Would Choose Telehealth Over Human Contact with their care provider! (survey). Just to give you an impression of how dynamic developments “out there” are. There is a definite expectation among health care professionals about the impact of digital information to the quality of care. Beyond information on the drug itself, one is definitely in need of information about both background and consequences of using the drug in the perspective of practice of care: how would the drug facilitate the process of care, patients’ compliance, outcome of care and both patient and physician satisfaction with their use. These will be interesting items to add to drug information, once the doctor has appreciated its core data. In marketing terms for the industry, one could state that interests of market access information and marketing/sales information will overlap. In this way, there are many areas that can be added to the basic information about the drug, to be explored, digested and processed by the doctors, to hold their curiosity and help them appreciate the drug in all its aspects: efficacy, evidence, administration, ease of use, aspects related to instruction and support, compliance and care processes. Thus putting “costs” in a wider perspective. Now what is the impact of this to pharma and the medical devices industry? Are quickly bored. When the variety and depth of information given is limited, or even superficial, they are quickly acquainted with it and will then judge right away on its relevance to them. Without further information about the position of the drug in the context of therapies, I fear doctors will lose their appetite. This directly impacts the edetailing journey of the industry, both to the pharma and the devices industry! What Dominic Tyler notes in his blog mentioned above, is the fact that doctors already have more experience in their selection and processing of digital content than the industry has experience in developing it! All these recent studies show: doctors want to be “info-tained”, i.e. entertained while being informed – which is not an easy challenge. Most apps used for detailing, present information in a static way: covering different subjects. Even when the app creates opportunities to process information interactively during the detail, there is a moment when the information is recognized and acknowledged. If so, the doctor wants to go on processing the information: what’s its use to care, what are the implications to the caring process. Ignoring this need will lead to irritation, certainly so when calls are performed rather frequently. No wonder that doctors turn away from the offered sources earlier than expected. Based upon the survey results above, one would like to add the third dimension: development! Development of dynamic edetails is more crucial than to produce a good-looking app. Apps need to further interactivity and engagement. They must stimulate the journey of the professional through the information about the drug, leading to connections both to persons of reference and to further information. Indeed the very relationship with other (multi-channel) sites and communications is relevant to the attractiveness to target professionals. When the opportunities by digital communication are to be exploited to engage with the health professionals more frequently and more intense, it is not only the design of the app itself that is crucial. The people who handle the app and its subsequent engagement, need to know what to do: specifically how to pace the information stream and how to dose the proportions of new information for the doctor, specifically so when (s)he is enabled to one’s proper route through the information. This is what digital design features enable. So in subsequent stages of edetailing, the very development of the app itself might be the third dimension to create sustainable attractiveness. App and related website(s), must present a dynamic context that proves to be in progress. This is to be demonstrated by dynamically presenting new content, also in ‘new’ formats of presentation as well. It is here indeed where use of video and personal reference come in, but also where formats of different interactivity plays a role. To create the path of development for the app is as necessary as its first design. Every stage of development will determine different patterns of information, engagement, interaction and cooperation. Every stage of app development thus presents its own conditions for effectiveness. App development is not just about structures of information but also about related structures of interaction. To learn how this can be done, makes experience with it vital for the development of edetailing. The industry might want to be supported by those who have this experience already. But still another aspect is crucial to success in the long run: how does the organization respond to the challenges that edetailing poses to the firm’s current routines of promotion? Creating an app is one. But to handle it in promotion to doctors and other health professionals demands internal training and organization. This is one of the success factors of edetailing. It relates to the challenges to internal cooperation and coordination for process efficiency. Actually, it should lead to a true multidisciplinary approach in cooperation between departments. True cooperation must go beyond meetings in which different participants from departments are present but do not seem to be able to really discuss, balance and integrate their different perspectives and interests. With a hierarchical management structure given, hierarchically based statements often do present the highest possible level of internal co-creation. It means that the design of the app and its use needs to follow the pace of individual learning and of internal change and development; a change that would also relate to development of internal culture of orientation: from an “inside-out product orientation”, to an “outside-in orientation on best practice of therapy”! Therefore, creating apps for edetailing is about more than just an “app-on-a-tablet”. The most important condition to successful development is to manage needed change within the organization. Create a specific road map for the development and change within the organization! This should pace the new external approach to the market in line with internal necessary changes. There is ample opportunity for this. You might also like to see how I published earlier about it here.